This was an Exciting renovation of the Reknown Standard Hotel in Hollywood. The space was completely gutted and a structural steel framework set up to isolate the space from adjoining areas. New mechanical, electrical, HVAC and plumbing were set up for all new service areas and bathrooms. ADA compliance with Health department sign off as usual. Fire life safety and Building and Safety all on board. Interiors were shaped to feel like tunnels connecting the Entry and service areas. The bar was completely custom and backlit with color throughout. All vents and light fixtures are futuristic. Custom foam Acoustic ceiling is adhered to the entire ceiling for Sound attenuation. Acrylic rods surround the room in a wave like manner with backlighting, giving a sense of a floating, colorful, transparent wall. The bar extends out into the room with an attached Soffit creating a covering over the bars sitting/ drinking area. The bar and soffit are finished with satin and mirror chem.metal. The purple rubber floor in the main area wraps up and onto the curved bar counter. All other areas are epoxy covered curved, shaped base. All walls have a soft radius to them. Openings leading into the main space incorporate custom curved stainless steel jambs. Materials used: stainless steel, Laminates, chem. Metals, Acrylic rods, Plexiglas, Epoxy floor, Rubber floor, Spandrel [Back painted glass] Smoked mirror, Plexi mirror. The space is Fun, Alive and Open. 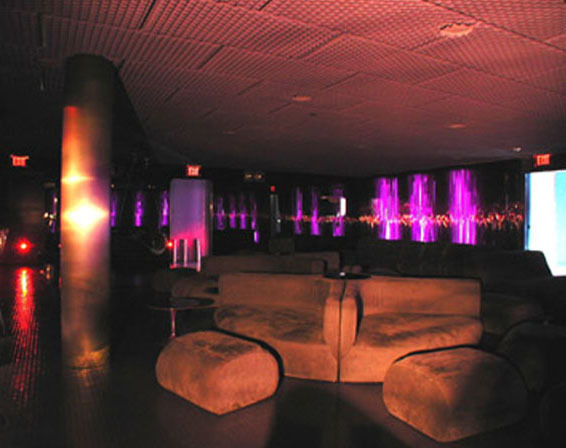 It has become one of the best known Lounges in Los Angeles.